Despite increased demand across the globe today, the US and Canada still produce 95% of the world’s blueberries. Bushes full of ripe blueberries on a farm in the US state of Michigan. Fresh blueberries are plump, juicy, sweet, and known for a myriad of health benefits. Thanks to widespread cultivation over greater ranges and advances in agricultural science, today they are widely available basically year-round as well. Although “high bush” blueberry plants are native to North America, many would be surprised at the immense varieties available across the globe, and all the different places that they grow. International demand and supply of blueberries has reached an all-time high in the past couple of years, and has not slowed down over the past year. For this reason, blueberry exports have increased far more rapidly than the overall world production. Still, some countries fare far better than others when it comes to producing these sweet balls of natural goodness. Standing at number one in this list is the United States, which produces nearly 240 thousand tons of blueberries a year. 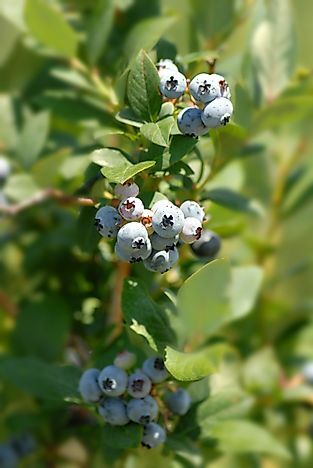 Although blueberry bushes are found just about everywhere in the country and 38 states are known to grow blueberries commercially, ten states are said to account for more than 98% of America’s blueberry production. These include Michigan, Oregon, Washington, Georgia, New Jersey, California, North Carolina, Florida, Mississippi, and Indiana. More than half of America’s produce is shipped to the produce markets, so as to fulfill the ever-increasing demand of farm-fresh blueberries. The rest of the produce is frozen, concentrated, pureed, canned or dried so that it can be used in various food products, such as fruit juice, spreads, and flavorings in prepared products. The country that produces the second highest tonnage of blueberries is Canada, which is known for its production of low bush blueberries and wild blueberries. Within Canada, the largest quantities of blueberries are produced in Quebec, especially the Saguenay-Lac St. Jean region of northern Quebec. Blueberries are Canada’s largest fruit crop, and much of the Canadian crop is directly put into storage for processing rather than for use as fresh fruit, in stark contrast to US blueberries to the south. Number three in this list of countries that produce the most blueberries around the world is Poland, where the production of the fruit reaches nearly 13 thousand tons a year. The two countries that Poland mostly exports its blueberries to are Germany and the United Kingdom. The plantation area within the country has steadily expanded ever since Poland’s accession as a member of the European Union. There are quite a few other countries around the world that have gained popularity for their immense production of blueberries, and follow Poland closely in output. One of the names on the list is Germany, which produces over 10 thousand tons of blueberries a year. The majority of blueberries in Germany are produced in Baden-Württemberg, Lower Saxony, and Nordrhein-Westfalen. Other countries that produce high amounts of blueberries are Mexico, France, the Netherlands, Spain, Sweden and New Zealand. They each produce 10,160, 9,011, 5,498, 5,000, 2,888 and 2,718 tons of blueberries a year, respectively. After these, national production per year drops off dramatically for the rest of the world’s countries. The amount of blueberries produced in Denmark equates to only 125 tons a year. Portugal musters a mere 255 tons, while Switzerland registers 308 tons of blueberries produced annually. Due to an already entrenched industry therein, a generally higher level of accessibility to land, and native climate conditions conducive to blueberry growth, it seems unlikely any country will challenge the North America’s two leaders in blueberry output any time soon.